Julie A. Freischlag, MD, has lived a life filled with accomplishments and unexpected turns. She encouraged others to find their own path, become leaders and make their mark on those they meet during her keynote address at the inaugural Western University of Health Sciences College of Podiatric Medicine Lawrence B. Harkless Dean’s Distinguished Lecture March 3, 2016 in Pomona, California. 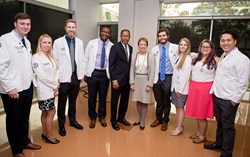 WesternU College of Podiatric Medicine Dean Lawrence Harkless, DPM, and UC Davis School of Medicine Dean and Vice Chancellor for Human Health Sciences Julie Freischlag, MD, (center) with CPM students. Freischlag is Vice Chancellor for Human Health Sciences and Dean of the UC Davis School of Medicine. She oversees UC Davis Health System’s academic, research and clinical programs, including the School of Medicine, the Betty Irene Moore School of Nursing, the 1,000-member physician practice group, and UC Davis Medical Center. She has served as a vascular surgeon and chair at some of the most prestigious medical schools in the country, but she comes from humble beginnings. One grandfather was a coal miner and the other built boilers for the railroad. Her grandfather told her that she could do anything she wanted, regardless of what others might say. She then passed on this advice to those in attendance. After completing her bachelor’s degree at the University of Illinois, she was accepted to Rush University Medical College in Chicago. She wanted to be a pediatrician until her first surgery rotation in her third year. She completed her surgical residency and vascular fellowship at the David Geffen School of Medicine at UCLA. During this time she also became more familiar with podiatric medicine. The first podiatry resident she worked with told her he became a podiatrist because he used to go to the podiatrist with his mother. The podiatrist made his mother feel so good and so comforted. She then went to UC San Diego for her first job and worked with her first professional partner, Dr. Bob Hye, who died last week. Hye taught her a valuable lesson early in their practice. His daughter had an ear infection and needed to have it lanced in the emergency room. Hye was in the middle of a case, and he asked Freischlag to finish it for him while he helped care for his daughter. “This was 1988. There was no work-life balance. There was no balance. There was work,” Freischlag said. “He had the ability to prioritize. I finished his case and he took care of his daughter. Her professional career and personal life took many turns. She went to Milwaukee, then returned to UCLA, then went to Johns Hopkins Medical Institutions. She got divorced, remarried, and had a son through in vitro fertilization. There are two things that make a great leader, partner, or friend, she said. She recommended reading the book “Drive: The Surprising Truth About What Motivates Us,” by Daniel H. Pink. She decided to leave Johns Hopkins when she started reviewing the strategic plan and realized her division chiefs could do a great job without her. Eight of them had already left to become chairs at other institutions. She now works at UC Davis, which serves a diverse population in Northern California. It is important to recognize diversity, she said.